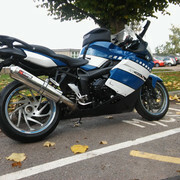 Intro Yourself to I-BMW.com Take a moment to introduce yourself and post a pic of you and your bike (optional)! Just an old retired guy who likes to ride, visit some of the rallies and do some tent camping. Western US trips can be 5-9K miles and last 6 weeks. appalachian areas are a little shorter. riding a small GS and always looking for similar thinking buddies to join in. Welcome to the site, glad you found us. Check the "Rally" forum, and "Ride Tales" forum for information on get togethers and trips our members have taken. BrucePaul, welcome. Meet Xavier electronically if you get a chance. He's a "little" GS rider, too. Hello and welcome from St Albans ,England.